Born in St Albans Ronnie was educated at Felsted School. His first job was working in a hat factory in Luton, but he later followed in his father's footsteps working for W & R Jacob & Co (Liverpool) Ltd, biscuit manufacturers. He joined the Officer Cadet Reserve after Munich. Attested in September 1939 in the Royal Artillery, he transferred to the Royal Army Service Corps in December in response to urgent pleas for drivers. He was called up in February 1940, commissioned in July 1940 to 292 Supply Company, 18 Division and embarked in October 1941 as Divisional Troops Supply Officer with the rank of Captain. He disembarked in Singapore (via India) on 29 January 1942 and became a POW at the capitulation on 15 February. Initially held in India Lines, Changi, he proceeded to Thailand in May 1943 with 'H' Force, "on loan" to the Japanese Thailand Administration. He returned to Singapore in November on completion of the railway, first to Sime Road and latterly to Changi Gaol. Captain Horner sailed for home on 27 September 1945. "At this stage it seemed almost inevitable, although we had to keep it from the men, that our ultimate fate was either capture or fighting on until we were all killed." 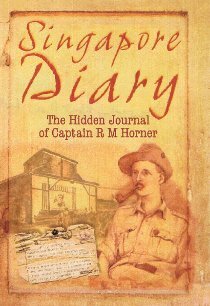 So wrote Captain Ronald Horner on 11 February 1942 about the fall of Singapore. As a prisoner of war of the Japanese, he took part in his first production ' I killed the Count' on 19 September. He went on to stage, or appear in, countless productions, often despite illness. "Down with another bout of malaria, a nuisance as we've just started Roadshows (4 inside and 3 outside the gaol) which I am running." On one occasion he introduced himself to the tune of Arthur Askey's 'Little Jack Horner they call me, Little Jack Horner that's me', a name that stuck for the duration of the war. Supported with many programmes, set designs and production notes, as well as cartoons and stories, this unique account provides an alternative view to the horrors of life as a "guest of the Imperial Japanese Army". Even his entries whilst working on the notorious Burma railway recount many amusing tales, even though as he says "I've lost count of the number of times I've been beaten up, varying from solid punches to the chin with clenched fist to slaps and blows from bamboo cane - oh what a jolly life we lead". His sense of humour, frankness about the situation that he and his fellow POWs were in and desire to make sure his story was told make this book a fascinating insight into day-to-day life of a man who was determined to get through his ordeal and help those around him to do the same. The repercussions had the diary been found would have been unimaginable but, after three and a half years in the false bottom of a suit case, it was safely brought home. This is his story.